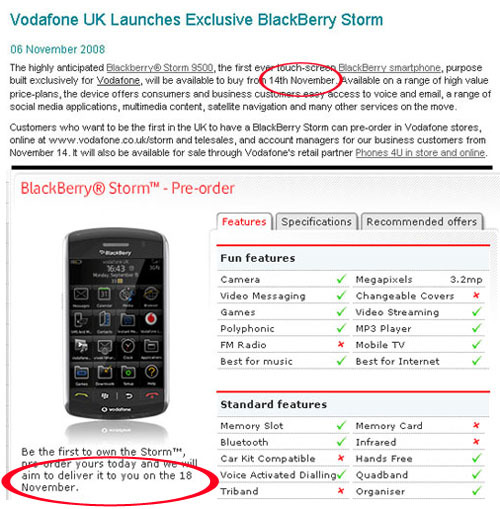 Vodafone today put out a press release announcing the launch of the Blackberry Storm on November 14 and also said that it was taking pre-orders. However, in a few short hours, the delivery date was updated on the pre-order page to be November 18th. Boy Genius Report, who reported this first, believes that Vodafone botched the launch. However, I feel that they are playing safe and taking a page out of the Android G1 phone where they announce a delivery date and deliver it earlier than expected. Let’s see how it plays out. « Verizon Blackberry Pricing and Best Buy ready to take pre-orders?